My first novel has been published and is available on Amazon Kindle! 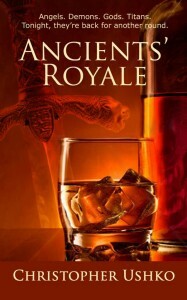 “Ancients’ Royale” follows the story of two brothers running a bar in Halifax, and what happens when their past catches up to them. Their past being, of course, a nine thousand year-old demon sorceress and her angry band of chaos demons. Buildings will collapse, things will explode, bunnies will happen, you might find a spelling error or two – it’s fun and games for the whole family! I’m already writing the sequel, so hop on over to Amazon and grab your copy for your Kindle device or app. It’s cheap enough. Or if you’re waiting for the movie to come out, go tell all your friends to go buy it so some Hollywood types will get the hint. Or if you’ve simply just been wanting to give me money for anything I’ve ever made, just buy this instead and we’ll call it even. And if you like it, leave a review! And if you don’t like it, at least I have your money! I’ll updating again on this in the coming months when it hits different platforms, but for now, thanks to everyone who made this book possible! Sequel in the works. I liked it. I think parts of the first few chapters should’ve been reworked, but the rest was really good. The level of detail in the mythology especially was impressive. You clearly did a lot of research, and not being able to tell where you bent the mythology made it that much more interesting.